Bastille Day in Paris: Celebrating the World of Josephine Baker-- Life of 'Le Jazz Hot'! 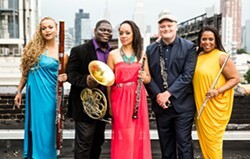 Since 1997 Imani Winds, the Grammy-nominated wind quintet, has taken a unique path carving out a distinct presence in the classical music world with its dynamic playing, culturally poignant programming, adventurous collaborations, and inspirational outreach programs. With two member composers and a deep commitment to commissioning new work, the group is enriching the traditional wind quintet repertoire while meaningfully bridging American, European, African and Latin American traditions. Imani Winds seeks to engage new voices into the modern classical idiom.